It was a lazy Thursday morning in Mumbai when I woke up to dad’s call; he wanted to know where I am, and why haven’t I updated my parents about my location. A calm and collected human being, he never approved of my vagabondism. 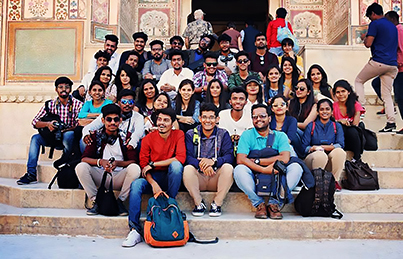 Having guaranteed him of my well-being, I left my bed to get ready for my trip- I was accompanying a group of 33 second-year students from the Wilfred College of Architecture, Mumbai for a guided architectural tour around Jaipur and Chandigarh! I left for Mumbai Central Terminus at about 3 in the afternoon; hopping trains and altering stations amidst the mad rush to reach Mumbai Central from Vashi is an arduous task especially with a heavy rucksack on your back. I settled myself temporarily in the waiting hall of BCT, and instructed the students to accumulate there! A few hours later, I was struggling to coordinate them into attending to the general set of directives; having managed to do that, I instructed them to get on the train, and get settled. As the train started rolling off the platform, the kids started a mad conundrum of laughter, drama and more, much to the alarm of the fellow passengers. We were nearing Jaipur every passing minute. Next day, the train arrived at Jaipur about three hours late. By the time we could get out of the hotel, it was almost 4:30 in the evening, and we missed the places that we were supposed to visit that day. I decided to give the students some free time for taking a trip to the marketplace, and they agreed cordially! Come next day, we were heading to the New Gate for a workshop by Ar. Pooja Agarwal from DRONAH foundation. The workshop involved students studying the street façade of the ‘Thathehro ka gali’ in the market complex. The kids proceeded to do some detailed sketches of the street façade and generating some street sections from the preliminary studies along with studying some individual shops in the area for a better understanding of how the ‘thatheras’ work. Once the session was over, the workshop concluded with a small lecture on how the façade is instrumental in climate control by efficiently letting the air to flow through. We proceeded to visit the Hawa Mahal from that place followed by Jantar Mantar as well as the City Palace. The tour guide in Jantar Mantar explained the functioning of the place with extreme efficiency and the students were delighted to see such precise work of geometry infused into architectural elements for the first time. Next day, we visited the Albert Hall Museum in the morning. It was a museum of considerable magnificence, and the morning sun along with the flock of white pigeons made the grand architecture of the place worthy of remembrance. 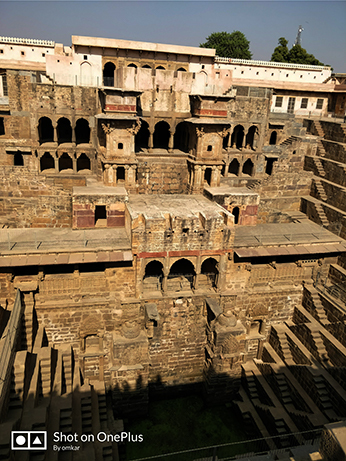 Having visited it, we quickly set out to sit the Chand Baori in the Abhaneri village. About two hours from Jaipur, this village hosts one of the most famous stepped well in Rajasthan. Having about 3500 steps and a total depth of about 30 meters, this is one of the oldest and deepest step well in the country. The students also visited the Harshad Mata ki Mandir which sits just beside the Baori. Having our lunch from one of the highway dhabas, we returned to our residence by evening. The day was long, dusty and hectic, but the charm of the stepped well made it all worth it. The coming day, it was finally time to visit the Jawahar Kala Kendra. It’s a delinquency to be at Jaipur and not visit the JKK, especially being architects. The students stood in awe below the painted dome and realized the grandeur of a space designed by the Master himself. We proceeded to move to see the Pearl Academy of Design designed by Morphogenesis from JKK. A designated guide gave the students a detailed explanation while taking them on a trip of the campus. 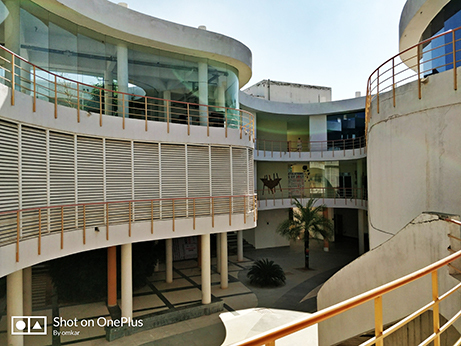 The campus has been beautifully designed keeping in mind the arid climate of Jaipur. An intelligent interplay of mass and void regulates airflow through the building, and the lower levels of the building consist of covered patios and open-air theaters. These covered spaces allow students to comfortably work and complete their assignments together, fostering their mental growth and their ability to work in a participatory environment. Having finished with lunch in the academy’s canteen, we finally proceeded towards the Amber Fort, the shining jewel of Jaipur. Having obtained the necessary permissions, we got an official to conduct a guided tour of the fort. The entire tour took about three hours to complete, and it was a tough job on the part of the coordinator to manage the kids amongst the crowd of tourists. Try controlling a batch of second years in an interesting and happening place like Amber Fort. You will know the pain of a coordinator at that exact instant. Having spent enough time at the majestic fort, it was time to get back. 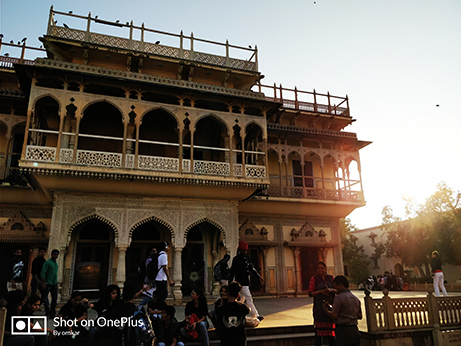 A tired and exhausting batch of students boarded the bus and slept their way back to Hotel Park Classic, where we lodged during our stay at Jaipur. On our last day in Jaipur, we visited Ghat Ki Guni, a brilliantly built stepped garden on the entrance area of Jaipur. 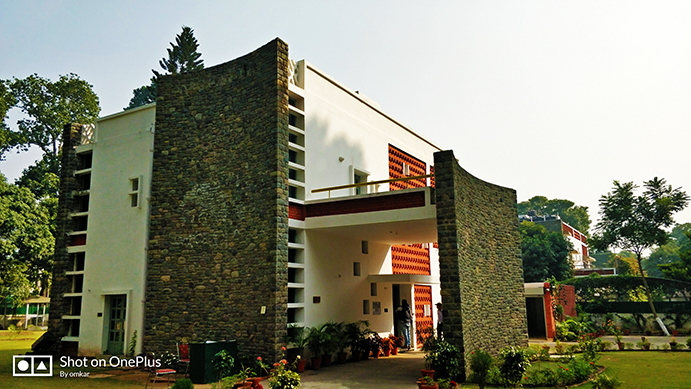 The place is located on the slopes of a hill and creates a brilliant vista of well-designed gardens. The Islamic influence of char-bagh is visible in here and the place offers a soothing relaxation to the fast-paced mind. We proceeded to the marketplace because the students requested to have an evening for a non-conducted walk around! Having finished our stay in Jaipur, we proceeded to the station for round two: Chandigarh. We reached Chandigarh next morning. It was chilly, and we directly boarded the bus to our accommodation. Having our breakfast, we proceeded to visit the three museums of Chandigarh, Natural History Museum, Chandigarh Architecture Museum and Government Museum of Art. Having visited all three, we proceeded to the Rock Garden. 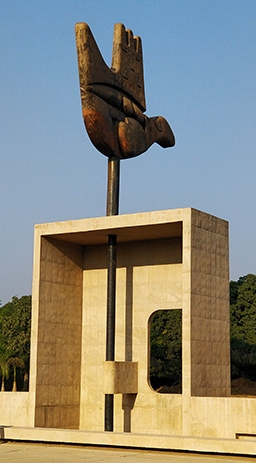 Created by Nek Chand, this garden was the only point of confusion and illusion amongst a city born out of grids and the pencils of an architect. We proceeded to visit Virasat-e-Khalsa in the holy city of Anandpur Sahib the next day. 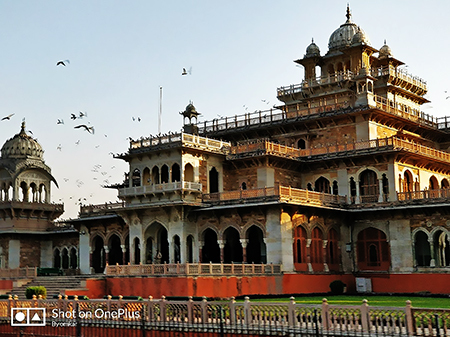 It’s a two-hour journey from the city of Chandigarh, and its every bit worth the time. A wonderful building in a calm and serene setting, it can engage the audience into a captivating journey. Having spent close to three hours in the place, we went to a nearby Gurdwara for having Langar. 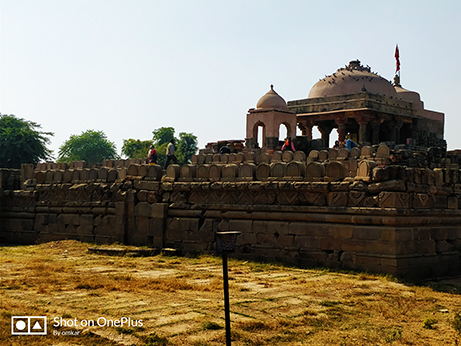 Having returned to the city, we proceeded to visit the Sukna Lake in the evening where Ar. Simran from the city briefed the students about the growth and spread of the city of Chandigarh. It was originally planned to be a half-hour long session, however, it extended for almost an hour and a half, credits to the constant questions from the students! The last day in Chandigarh was reserved for a guided tour of the Capitol Complex and the Sector 17 market study. However, thanks to the students, we missed the 10 am slot of the tour. We were instructed to come back for the afternoon session starting 3 pm, and we decided to take a detour to the residence of Pierre Jeanerette, which originally used to be his residence. It took us about two hours for the trip, and we soaked up the splendid vibes offered by the complex. We proceeded to Sector 17 for an open tour and study of the market area. It was time to board the train back to Mumbai and we proceeded to the station for the same. I was a tired man when I finally realized my duty is over. I was standing on the foot overbridge of Panvel station, and students were saying goodbyes, and waving at each other on their way back home. Ten days of hard labor (I would love to call it labor), and endless tensions had finally come to an end, and it was time to take rest. I reached Vashi on an empty train and having reached the INKUISITIVE safe house, I crashed immediately. What did I learn? Firstly, it’s a tough, very tough job to be a teacher. One simply cannot expect a batch of students to obey him just because he is on the other side of the table. It took me a few days to pick up the tone and the pace; when I finally was able to get the ‘command’, it was an empowering feeling. Secondly, one cannot expect the students to listen to commands and obey, especially when they are in a trip. Students should be given a fair amount of liberty and freedom on educational trips as well, this is important so as to allow them to breathe. College is a tight situation for architecture students with all the pressure and deadlines, and a much-sought-after event like tour should not be an imposing affair on them. As a coordinator, it definitely is my responsibility to guide students and see to it that they are doing their studies properly, but one must give them the chance to play along. Third, things won’t go as is planned. Trains are bound to arrive late, and students will always be late, doesn’t matter your repeated warnings. So, one needs to be ready to accommodate time delays, irregularities and erratic behaviors as well. You will also need to readjust schedules, and accommodate requests, so it is always a welcome move to keep an hour at hand! However, there’s no necessity of leniency that can result in a messed up situation often. Deny them? Next time, go on a trip with thirty kids onboard! You will come back a smarter human being!